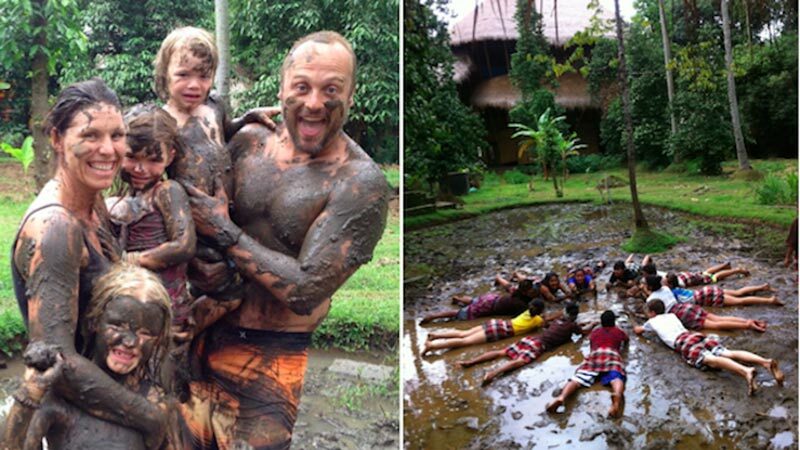 Bali with kids can be fun and exciting. There are a wide range of activities to suit the whole family and keep you entertained for hours and days. Best time to visit Bali is the dry season. May, June and the second half of September are the least crowded with plenty of sunshine and less humidity. There are a multitude of beaches in Bali to choose from. Unfortunately many of them have really big waves and strong currents at times. 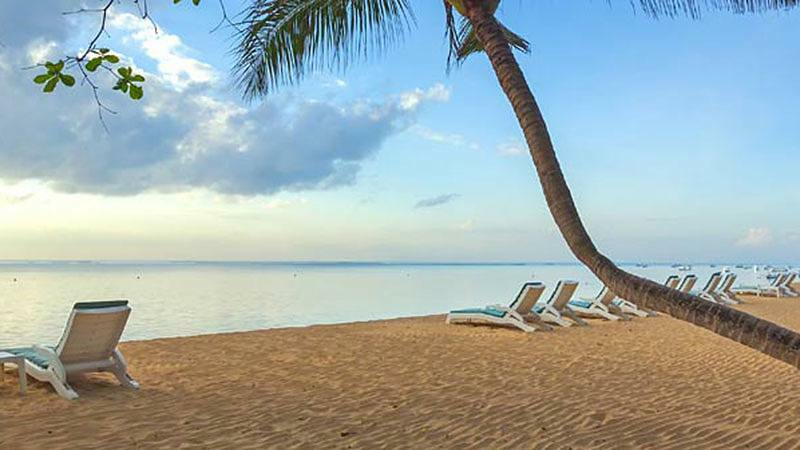 In the South it’s best to stick to Jimbaran beach with its shallow waters and mellow waves (and while you’re at it stay for a delicious beachside seafood dinner) or head to Sanur beach which is a family hangout spot for tourists as well as locals and expats. On Sundays there is always a lot of activities for children. In the North of Bali Lovina offers quiet black sand beaches good for snorkelling. The beaches around Padang Bai in the East of Bali are often mentioned as good spots for some family-time. Sunday brunch at Ku De Ta in Seminyak is a must for someone visiting Bali with kids. There is a special children’s menu available with favourites such as fish and chips, while the grown-ups get to feast on a multitude of other delicacies. Every Sunday there are different rides, games and activities on offer and of course a kid-friendly swimming pool. 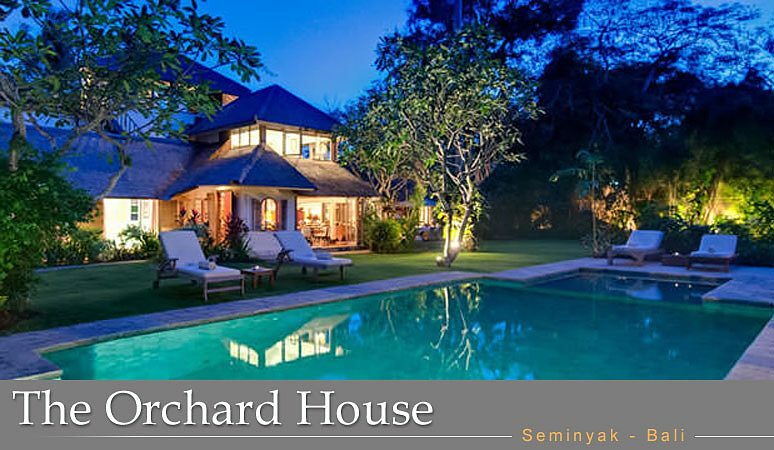 The staff is extremely attentive and helpful, so the parents are also able to relax for a while. Another child-friendly, italian-style Sunday family brunch is served at Prego at The Westin Resort in Nusa Dua. Kids have free access to the pool, can enjoy the indoor/outdoor kids corner and monthly themed activities and entertainment. 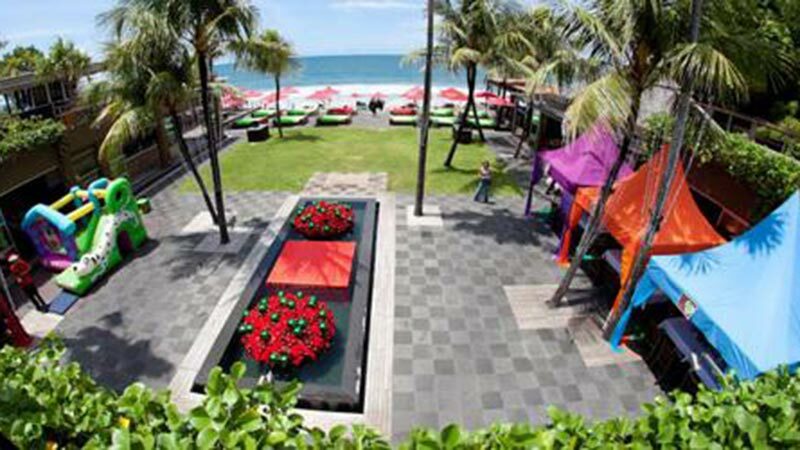 Potato Head Beach Club in Seminyak is a chillaxed hangout that welcomes cool kids during the day. The menu offers yummy stuff for both adults and kids (check out the cheese plate!). In Ubud Pizza Bagus serves pizza and pasta with a side of playing blocks, crayons and paper for the little ones and darts or futsal for older kids. 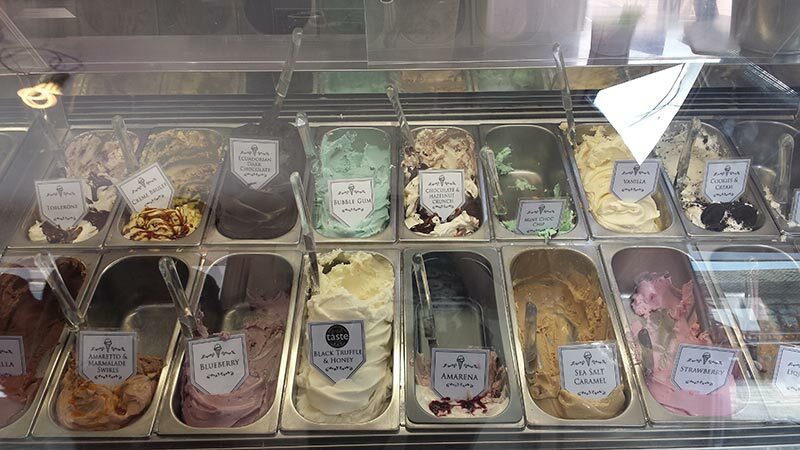 Don’t miss out on some ice cream time at Gusto Gelato&Caffe in Kerobokan or Lello Lello in Seminyak either. There is a multitude of playgrounds for kids, many of which are located in conjunction with big resorts. 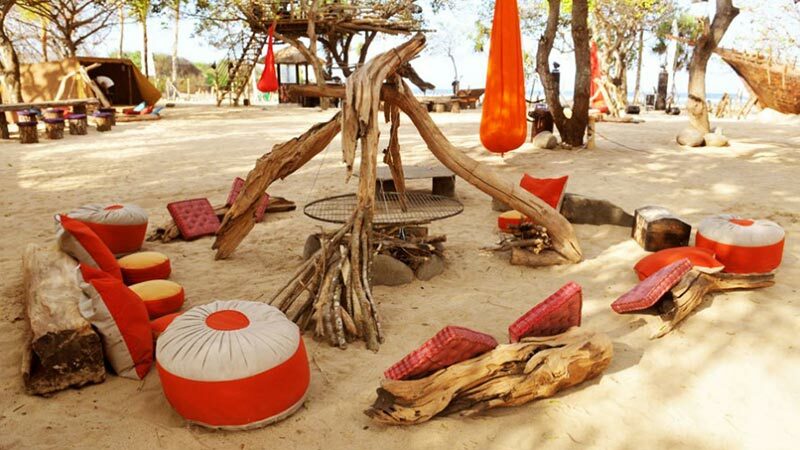 Kura Kura Kids Club at Conrad Bali in Nusa Dua offers kite-flying, cooking, facepainting, balinese dance classes, ship building and balloon volleyball for kids between 3-12 years of age. They also have indoor game zone, pool table and a toddler area. 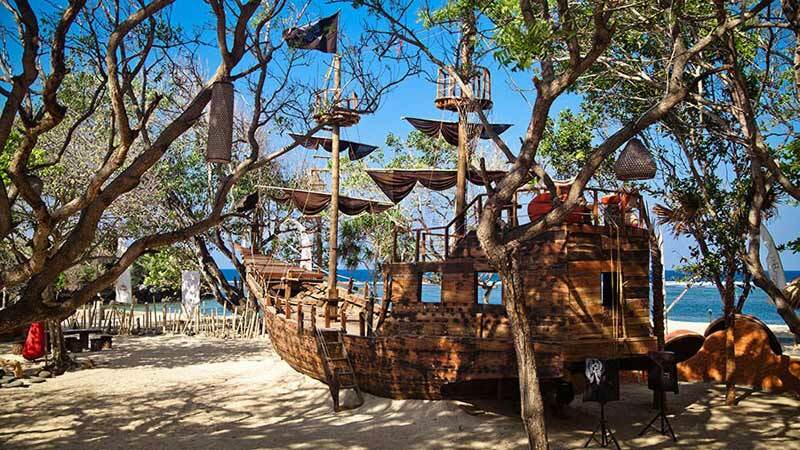 Pirates Bay Restaurant in Nusa Dua offers pirate camp packages, where kids can engage in activities such as treasure hunt, kite-building and zip-lining. Kupu-Kupu Kiddies Club at Bali Dynasty Resort in Kuta has an air-conditioned club house, a kids’ pool and waterfun zone for kids between the ages of 4 and 16. Lil’ Rock Kids Club at Hard Rock Hotel Bali in Kuta has lego-building, treasure hunts, rock climbing and kids olympics for 3-12 years olds. They also host TABU, which is suitable for teenagers. It is open until 7pm with an internet and gaming lounge, cinema area, bar and lounge and pool table. Along Sunset Road you can find Lollipop’s Playland and Cafe where children from 1 year on can enjoy interactive storytelling, ice cream parties and cooking classes. In Sanur there’s Peek A Boo indoor playground for kids up to 10 years of age. Waterbom in Kuta is the best-known and I would say the most fun for kids as well as adults. It offers dozens of activities to keep the whole group entertained for hours. There’s a water play area for the little ones and speedy slides for older kids. The parents can join their kids on the slides or enjoy the more mellow activities such as floating down the lazy river or lying down in the gardens. 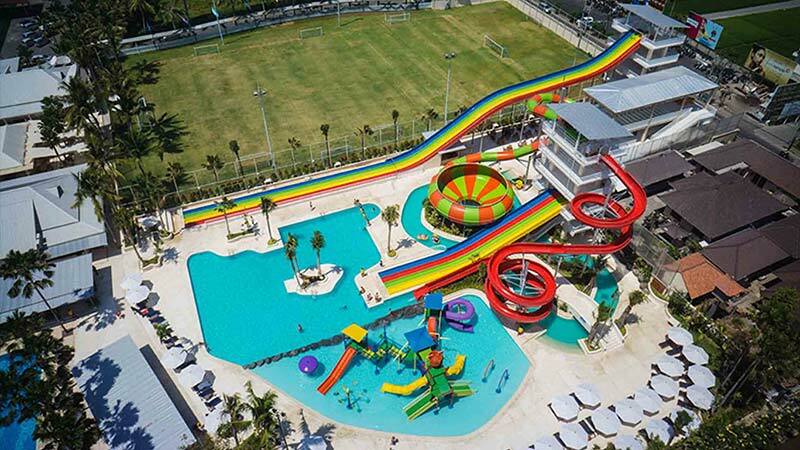 Other waterpark options are Circus Waterpark on the outskirts of Kuta, New Kuta Green Park next to Dreamland beach on the Bukit Peninsula and the newest addition Splash at Canggu Club. At Canggu Club you can also find Bounce, Bali’s first indoor trampoline fun center, and Strike 10 Pin Bowling. 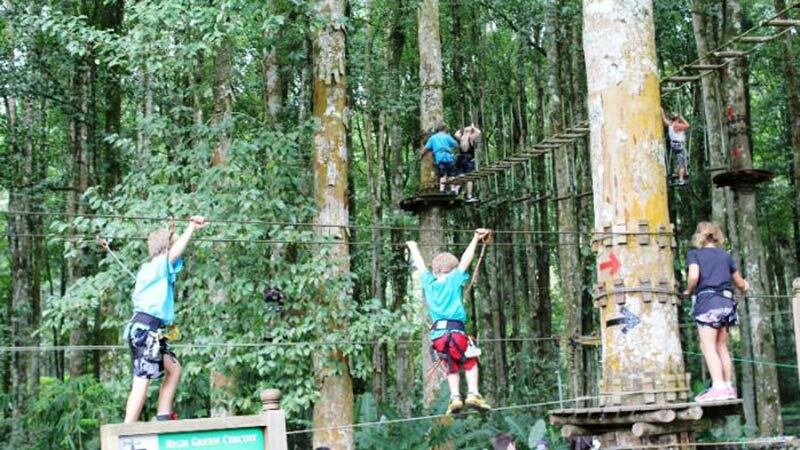 The Bali Treetop Adventure Park, located at the Botanical Gardens in Bedugul, offers a range of 7 adventure circuits (ranging in height from 2-20 meters, easiest of which are suitable for kids from 4 years on), 72 challenges such as spider nets, tarzan jumps and flying swings and 12 ziplines up to 160 metres long to get your adrenaline pumping. With the entrance fee you will have 2,5 hours time to access all the circuits and challenges. Entry is advised as early in the morning as possible to avoid the crowds and the possibility of rain. Let’s face it, most kids love animals. In Bali it is possible to meet many of which you probably cannot meet back at home. 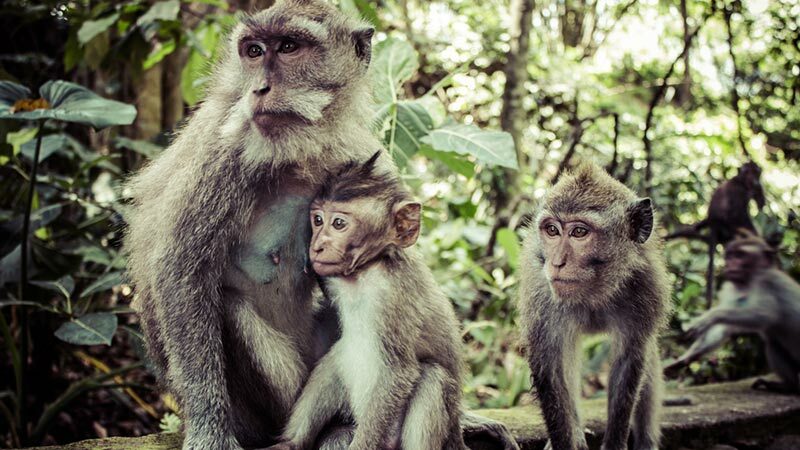 You should check out the Monkey Forest Sanctuary in Ubud, which you can enter for a mere Rp.20 000 per person. The sanctuary has a real rainforest/jungle feel to it with majestic trees and temples. Inside the monkeys are allowed to roam free as are kids. Just beware the curious animals who are more than happy to steal any loose objects or food out of bags. You can buy some bananas afterwards and feed the monkeys outside. In Lovina you will get the chance to go on an early morning dolphin watching trip. Most days these beauties of the sea can be seen plentiful. Serangan Turtle Conservation and Education Centre on the island of Serangan next to Sanur, a hatchery and a protection center for the injured specimen found at sea, is a wonderful place to learn about the sea turtles. Between April and October for a small donation kids are able to adopt a baby sea turtle and get to release it to the sea. 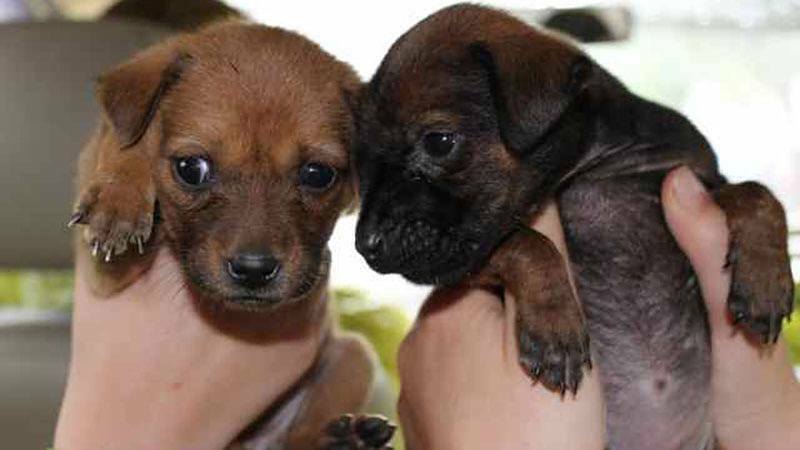 If the kids are after some cuddles, go visit Bali Adoption & Rehabilitation Centre or Bali Animal Welfare Association facilities in Ubud to meet the lovely rescued Bali dogs and cats who always appreciate some playmates. As these organisations are based on volunteering and donations, you could bring with you a bag of dog/cat food. There are some wonderful things to experience when in Bali with kids. 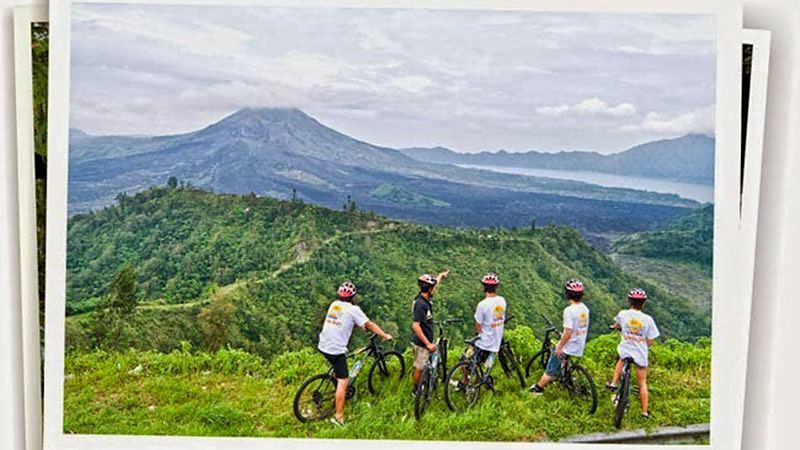 Should you wish to get the most out of Bali’s beautiful landscape, bike tours and hikes are activities recommended in Ubud and Kintamani. You can take a tour on your own with the help of a map, but better yet is to book an organized tour where a guide will help you get the most out of your adventure. Why not also try surfing on Kuta beach, still a favourite beginner’s spot. You can book a lesson for the whole family from the many “beach stalls” there. In case you want to completely immerse yourself in nature, book a nature-inspired program from the Green Camp. It’s an authentic eco-camp far off the beaten track where you can experience intrepid explorations into the jungle or rice fields, swim in spring-fed rock pools and make a difference by contributing to their ongoing community service and sustainable agricultural projects. They offer 3 or 5-day Family Green Adventures starting from $330 for adults and $121 for kids. The Trick-eye 3D painting galleries are a novel addition to Bali’s choice of attractions. They offer amazing photo opportunities and great fun for the whole family. 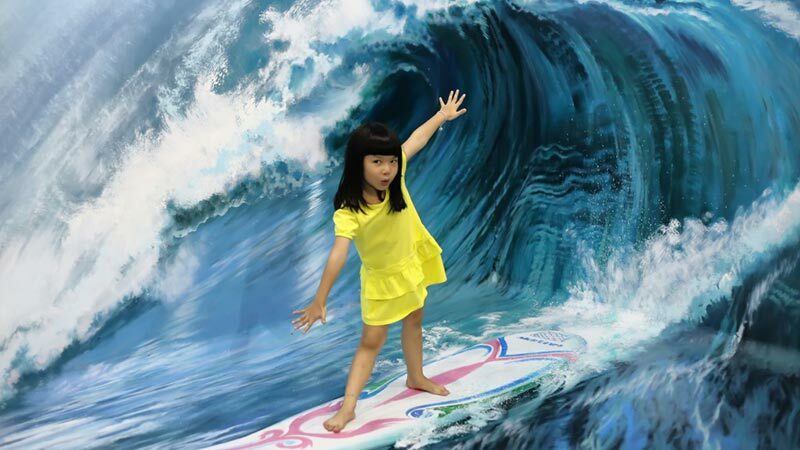 At Trick Art 3D Gallery Bali on Sunset Road there are approximately 80 pieces of life-sized and realistic murals to interact with, from parodied takes on famous and classical paintings and blockbuster movie characters to fairytale and magical themes. DMZ Gallery in Seminyak has 120 art pieces created by world-renowned Korean illusion artists. 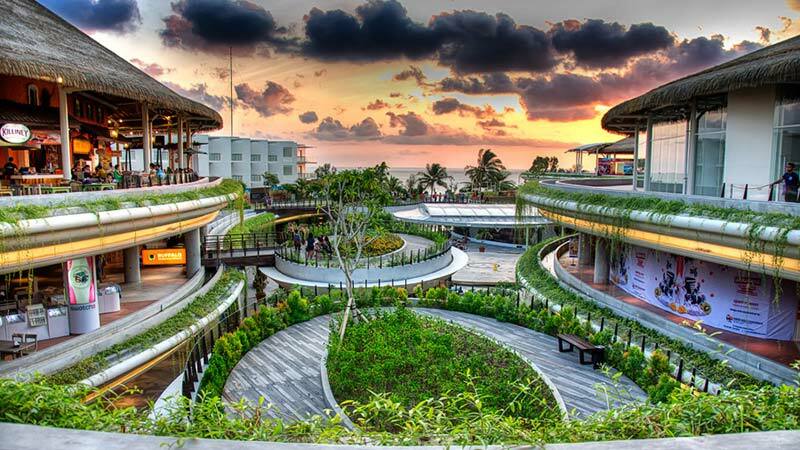 Beachwalk Mall on Kuta Beach Road offers great shopping with international brand stores, a sizeable selection of restaurants for every taste, an upstairs playground with nannies, an arcade game area and also a cinema showing movies only a short while after they premiere in Europe. You ca just leave your kids to play upstairs while you go shopping. If you’re visiting on a Sunday, head for the nearby Sheraton hotel for Sunday Market Brunch, which boasts multiple different buffets to please every taste and also nannies to take care of the little ones. With your bellies full book tickets for the Beachwalk XXI Premiere cinema. 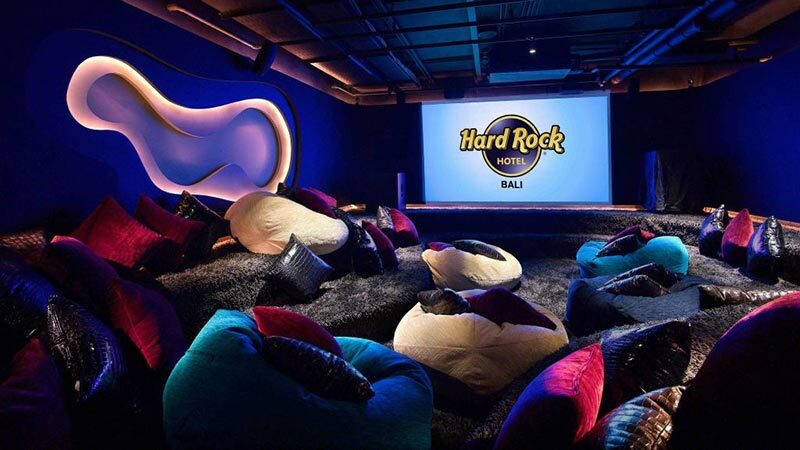 There you get to watch a movie lounging on big comfortable seats with plenty of leg-room for only Rp.100 000 per person Monday through Thursday, Rp.150 000 on Fridays and Rp.200 000 Saturday to Sunday.